While confirming that the asteroid is not a threat to Earth, scientists say that if the asteroid were on course to impact earth it would cause a multimegaton atmospheric explosion over Earth’s surface, rather than impacting it. It potentially would be quite damaging (and even lethal) out to distances of 10 to 20 kilometers in all directions if it happened over a populated region with weak structures. Two asteroids, several meters in diameter and in unrelated orbits, passed within the moon’s distance of Earth on September 8th, 2010. 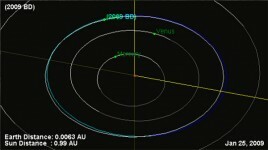 In April 2010 an asteroid roughly as long as a tennis court zoomed past Earth at about the distance of the moon. The last space rock to pass at or within lunar distance was 2009 JL2, an asteroid about 17 to 37 meters across, in May 2009. There is a roughly 50 percent chance of a 30-meter-plus asteroid striking Earth each century, according to NLSI team member Clark Chapman, space scientist at the Southwest Research Institute in Boulder, Colo.